From a client scraping by to major donor: We are overwhelmed by Ms. T’s generosity! 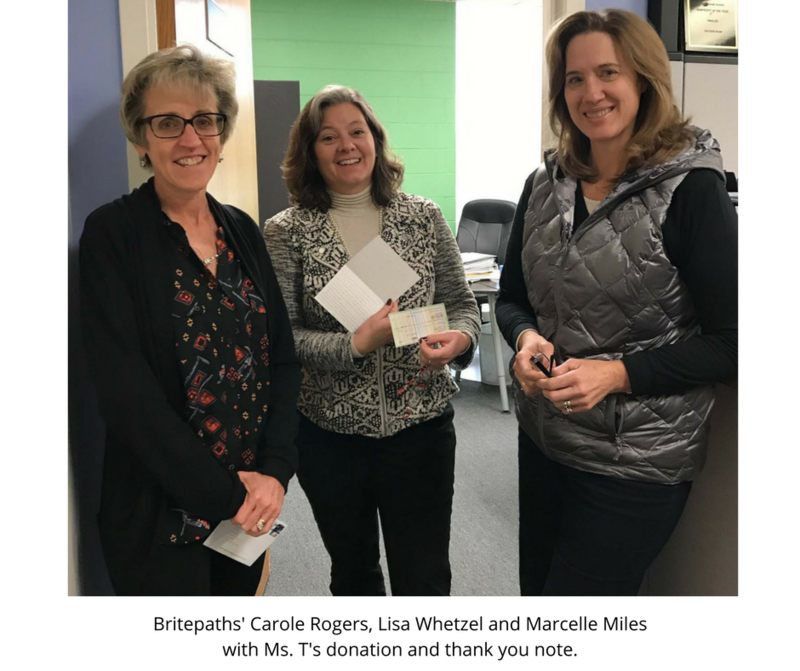 After helping her in a somewhat different way from the normal services we provide, Ms. T mailed Britepaths a check for $10,000. We have certainly received donations from former clients looking to “pay it forward,” but her story is simply amazing! Almost two years ago, our Financial Literacy Program Director Marcelle Miles received a referral for Financial Literacy services for Ms. T, who was struggling financially and unable to pay for basic necessities, including food. Initially, Marcelle connected her with one of our volunteer Financial Planners, but Ms. T has some issues that made it difficult for her to concentrate on the complexities of her financial situation. So, Marcelle and Financial Literacy Program Manager Carole Rogers decided to see what they could do to help her. After meeting with Ms. T several times and discussing the many details of her financial situation, they began to understand that she had worked for the Federal Government for many years, but she was not receiving a federal pension. She was having difficulties understanding the complexities of her benefits and advocating for herself. Marcelle and Carole sat with her and helped her call the federal Office of Personal Management (OPM) to see if she would be eligible for a federal pension. OPM determined that she should be entitled to a pension. Over the next year-and-a-half, Marcelle and Carole helped Ms. T with the lengthy retirement application process. Finally, she ended up with a substantial amount of back pay, a monthly pension set-up and health insurance that will allow her to live comfortably. Other Britepaths staff members also pitched in along the way to help as needed. They also helped her resolve other financial issues, and referred her to AARP for tax preparation assistance. We are overwhelmed and inspired by Ms. T’s generosity! We are happy to have played a role in her new-found financial security, and so excited to use her generous donation to make life better for other community members who are struggling. Thank YOU, Ms. T!